Gerry is born to be different. He has one ear. This book follows his struggles as he finds that the world can be tough if you look different. Gerry longs to be accepted but finds himself lonely and isolated. The other cats call him names. All Gerry wants is to be part of the crowd. It takes time for him to learn how to overcome bullying. Help comes from an unlikely source. 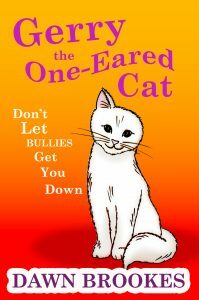 This entertaining and engaging story addresses issues of bullying diversity and acceptance.